One of the hottest teams in all of college basketball kept it up on Saturday afternoon at the Dean Dome, as the eighth-ranked Tar Heels took down the No. 16 Florida State Seminoles by a score of 77-59—good enough for their 10th victory in their last 11 games. Fresh off a huge 16-point win over No. 1 Duke this past Wednesday, it would be understandable if there was somewhat of a letdown for UNC (22-5, 12-2 ACC) while playing its second ranked opponent in a span of four days. 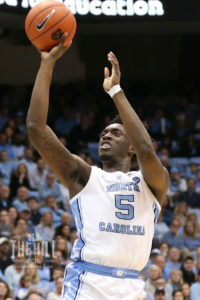 Fortunately for Tar Heel fans, that wasn’t the case at all as freshman wing Nassir Little provided enough energy for both his teammates and the crowd in attendance. Little—the heavily-hyped recruit who has struggled to find consistency this season—came off the bench and sparked the team with 18 points and eight rebounds in just 23 minutes. The Florida native also got the Smith Center rocking with a pair of highlight-reel slams that showed why he’s projected to be a high NBA draft pick this June. UNC also gave Little some help in the form of double-doubles from Cameron Johnson and Luke Maye. Johnson had 18 points and 10 rebounds, while Maye posted 15 points and 11 boards. “Nassir [Little] getting to the backboards is something that really helps us,” head coach Roy Williams told reporters afterwards. “He had one drive and dunked it quicker than anybody, and that’s what he can do. The win keeps Williams’ team in a tie atop the ACC standings with a 12-2 record against conference opponents, and should inspire confidence that this group of Tar Heels has no intentions of fading down the stretch. Florida State (21-6, 9-5 ACC) entered the game having won its previous eight games—all against ACC opponents—and could have made a case for being just as hot as the Tar Heels at the moment. The way things turned out, though, the Seminoles held the lead for just 45 seconds in the opening minutes before going on to suffer their largest defeat of the season. Despite struggling from three-point range for the second straight game, UNC still managed to find a way to dominate through a strong inside presence and lockdown defense. 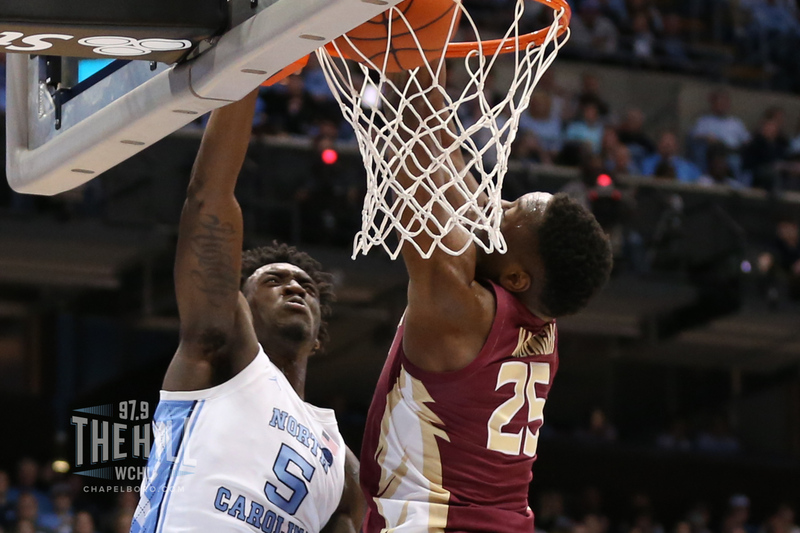 The Tar Heels scored 28 points in the paint, created 18 more on free throws and held Florida State to just 30 percent shooting from the floor—the Seminoles’ worst such mark in the last two years. 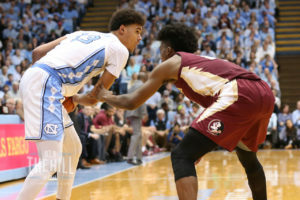 Not only that, UNC out-rebounded Florida State 47-32, which was one of the main points of emphasis from Williams entering the game. “That’s something we emphasize all the time,” Williams said. “So, you should do things better if it’s what you emphasize the most. That’s what we emphasize more than anything. The Tar Heels are scheduled to return to the court at the Dean Dome on Tuesday, when they host Syracuse in a game set for 9 p.m.
UNC made just seven of its 20 attempts from three-point range, after going 2-for-20 against Duke this past Wednesday. Freshman point guard Coby White struggled once again for the Tar Heels, scoring 10 points on 4-for-13 shooting–including an 0-for-5 mark from beyond the arc. He also had four assists and three turnovers. The 45 seconds that UNC trailed early in Saturday’s game represented the first time the Tar Heels had trailed since last Monday’s loss to Virginia–a span of over two full games.